I recently found these weird puppet-things tucked away on a shelf in the children's program room. I assume they were created by the teen volunteers who recently ran an Arts & Crafts session, but I have not confirmed that yet. 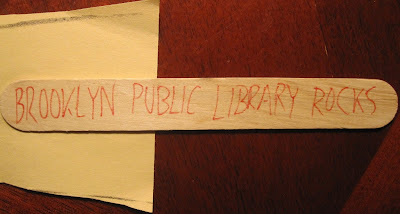 Until such a time, I will consider it a job done by those infamous library elves. In addition, I need some help in figuring out what the first one signifies, if anything. At first I thought the blue thing was a Tardis, but unlike the rest of you nerds, I don't watch "Doctor Who," so I'm not sure. (Just kidding! You're not nerds! Don't hate me! Doctor Who is a great show, probably!) 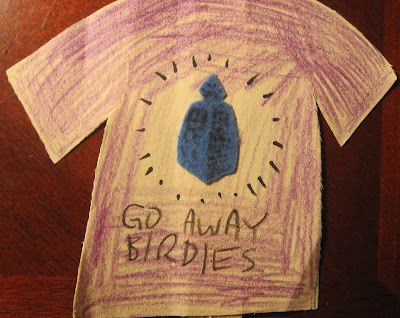 I also Googled "Go Away Birdies" with no relevant results. So, someone smarter than me, HELP. I rather like the angry demon guy. He looks like I do sometimes on a bad day when I'm sitting at the reference desk. 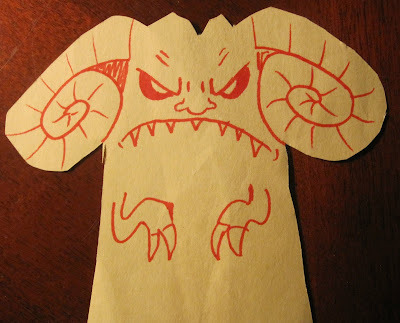 Cheer up, little demon. 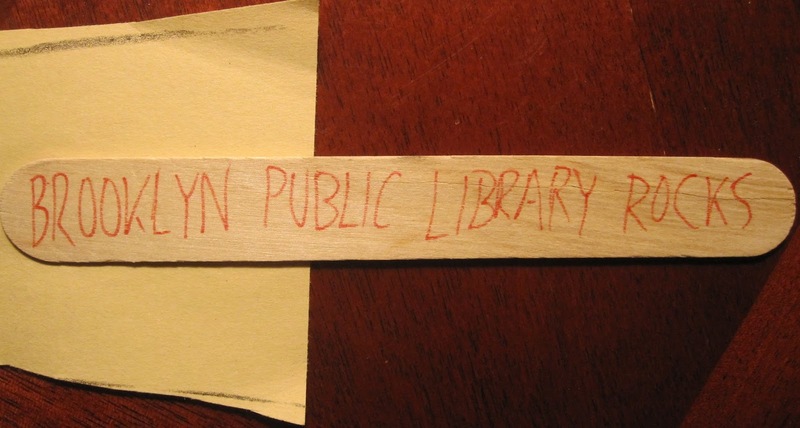 Also, this was statement written on the back of one of the popsicle sticks. Awww. 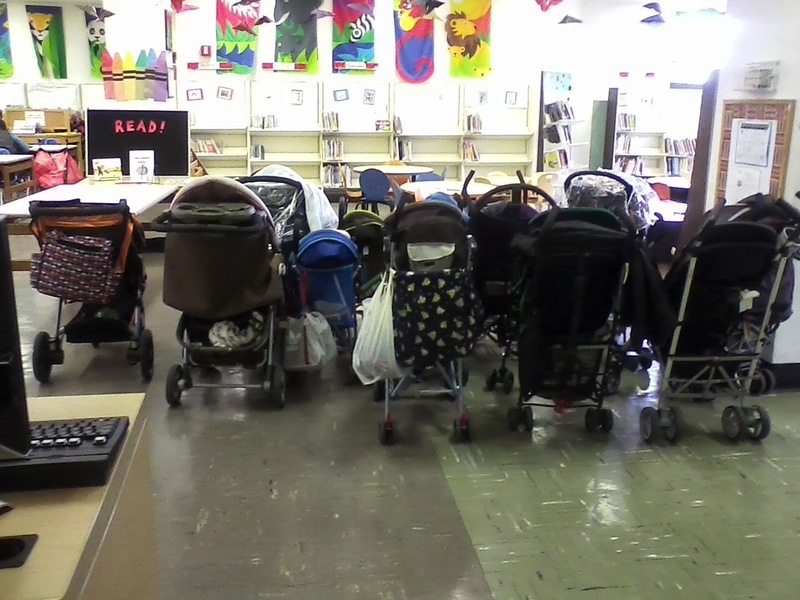 Isn't it nice to find NICE weird things in the library sometimes? I've started a new bookish advice column, Dear Book Nerd, over at Book Riot! Check out my first official post here, in which I do my best to advise a book-loving person whose family hates reading. And feel free to submit your own questions, should you be moved to do so! 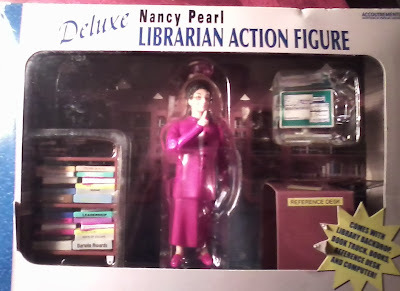 A few weeks ago, my mom called and said she and my dad were cleaning out the garage, and she found this librarian action figure thing and could she throw it out? So this past weekend I visited home and rescued the action figure from the "toss" pile. YOU'RE WELCOME, NANCY PEARL. Now I guess I just keep it in my apartment and absorb all of the superhero librarian powers, right? That's how this works?